The Mucusless Diet Healing System was written by Arnold Ehret, who at the age of 31 was pronounced incurable of Bright’s disease. His major symptoms were mucus and albumin in the urine with kidney pain. Thus he concluded that the best diet for healing should be free from both mucus and albumin and he later went on to study vegetarianism, naturopathy, medicine, and physiology. He tried various dietary approaches with limited success until he embarked on short fasts while on a fruit diet in Northern Africa, and began gradually to experience a major increase in vitality. He then undertook longer fasts in conjunction with what he termed a mucusless diet and was able to completely cure himself. Following this he began lecturing and writing about his discoveries. Ehret’s basic philosophy was that every disease is related to a mucus-clogged system that is the result of the accumulation of undigested and unnatural food substances, commencing in childhood. He believed that vitality depends on removing these obstructions. Ehret stated that there is only one cause of disease which is overeating and eating the wrong kind of food. He thought that fruit was the perfect food and along with some green leafy vegetables was all that was required in order to attain optimal health. 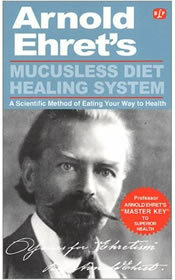 Ehret devised a mucus-free transition diet for dieters who would like to follow his approach in order to reagin their health and vitality, but find the strict diet too limiting, he actually warns dieters against sudden dietary changes because this can lead to an excessive release of toxins that the body will not be able to eliminate effectively. He recommended two meals daily that should be based primarily on fresh fruit and vegetables, cooked or raw as well as small amounts of raw nuts. Ehret was convinced that fasting is the key to attaining optimal health and recommended starting his program with a two or three day fast. He also advocated undertaking longer fasts of up to forty days once the dieter has gone through the transition diet. He believed that the first meal of the day should be delayed as much as possible because this extends the short daily overnight fast. Fruit and green leafy vegetables; cooked or raw. Look for other vegetarian recipes here. Ehret says that the most natural exercises are walking, dancing and singing and he suggests these forms of activity for dieters who wish to remain physically fit. He reminds dieters that extremes of any kind are harmful and this also applies to excessive exercise. The Mucusless Diet Healing System retails at $4.95. Good as a short term cleansing diet. Beneficial for dieters with digestive problems. Good for people who like to eat fruit. Offers suggestions for a transition diet. Extremely strict and difficult to adhere to. Recommends long fasts which may be very dangerous without medical supervision. Dieters will probably experience uncomfortable detox symptoms, especially in the initial stages of the diet. Socially disruptive and very difficult to eat out. Very low in protein, essential fats and certain minerals. Many dieters have reported negative effects such as dental problems and fatigue on this program. Some readers may be offended by some of the author’s politically incorrect statements. This book is outdated as it was written in 1922. The Mucusless Diet will most appeal to dieters who have a chronic health problem that has not improved by following standard treatment methods. It is quite an extreme approach that has produced good results for many people, especially in the short term, however it is lacking in many vital nutrients, which will produce health problems and nutritional deficiencies if this diet is followed for any length of time. Ehert, A. (2000). Mucusless Diet Healing System. Health Research Books. if you add naturally fermented vegetables there is nothing that can be missing, you can be on that kind of diet for years and years, as you will get all nutrients you need from bacterial metabolites. Sounds like fun! I am definitely going to try it. I’m not a meat – eater; so it sounds like ABC to me.